A couple of weeks ago, my friend Lauren Casper announced that she would be taking The Nester's 31 Day Blogging Challenge: write on one topic every day for 31 days. At the end of her post, she asked who would be taking on this challenge along with her. I thought about it for a nanosecond and then said, can't. Not enough time. Already taking on a big project elsewhere. No further questions. Oh brother. Shoulda known it wouldn't end there. I am currently involved in a small home Bible study with just a couple of women. The topic of the first chapter of the study: grace. A couple of Saturdays ago I attended a simulcast with Beth Moore. The theme: no longer under the law, but under grace. The following Sunday, the sermon centered around the idea of God giving us grace, even if it seems like we took the wrong path. The other night I picked up a book I have been trying to finish reading. And what was the chapter about? Grace. The next book on my reading list because it has been borrowed from a friend is called Threads of Grace. Don't look at your inabilities and dwell in insecurities. Look at the Almighty God. See this call as the opportunity to watch Him work in you and through you. If you answer yes to the question Is this beyond me? chances are God is speaking. Lysa TerKeurst, What Happens When Women Say Yes to God. Oh my goodness, I can hardly believe this happened. But, it seems very clear the Lord wants me to accept this challenge and write about grace for the next 31 days. And it feels intimidating on so many levels. 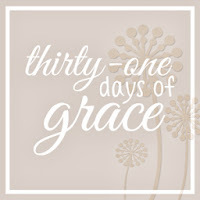 So I hope you'll join me in this 31 Days of Grace journey. I hardly know where to start and certainly don't know what will happen by the end. But I said yes ... and here I am. Stick around and let's explore this concept of grace together. Day 18: Question: What is the Opposite of Grace? Oh I am SO glad the Lord prompted your heart to do this!!! I can't wait to read your posts!! LOVE YOU and I am so proud of your Mommies Grieving With Hope launch!!! Looking forward to reading your posts. I will mention your series on my blog as I am making a list of 31 Dayers I am going to follow. Thank you Debbie! I like yours too ... Freezer meals ... so helpful! I'm looking forward to your thoughts,or rather,His thoughts,as they have been shown to you. you are not a bible scholar, but you are definitely a"guider of conscience"...and the Spirit in you is able and more. Praying for the revelation of Christ in you as you write and encourage us all in our journey, to grace. Thank you Darla ... and thank you for that quote.